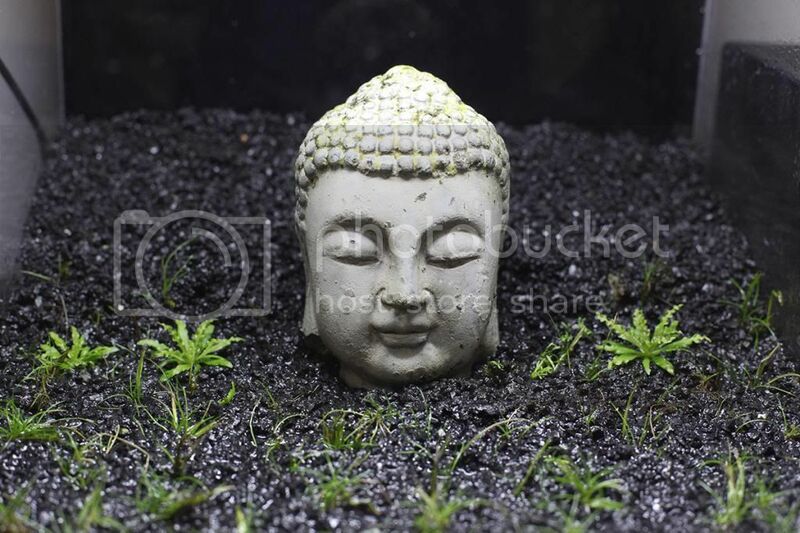 Decor: Buddha head I bought off ebay, looks to be made of concrete. 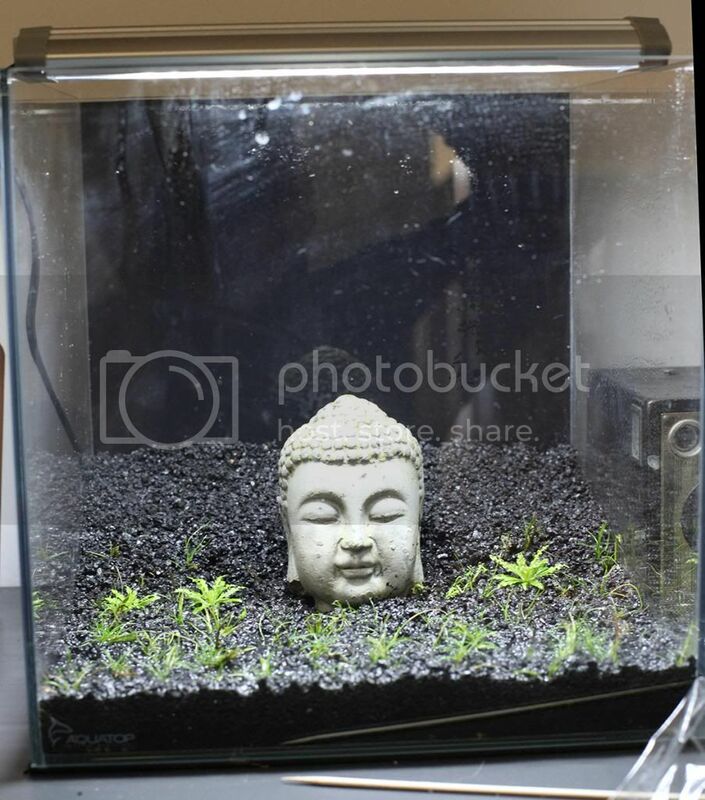 After seeing a few very well done "Buddha" tanks, I wanted to do on of my own in the living room. My wife is acutely aware of my growing MTS so I had to keep it small "nice looking". 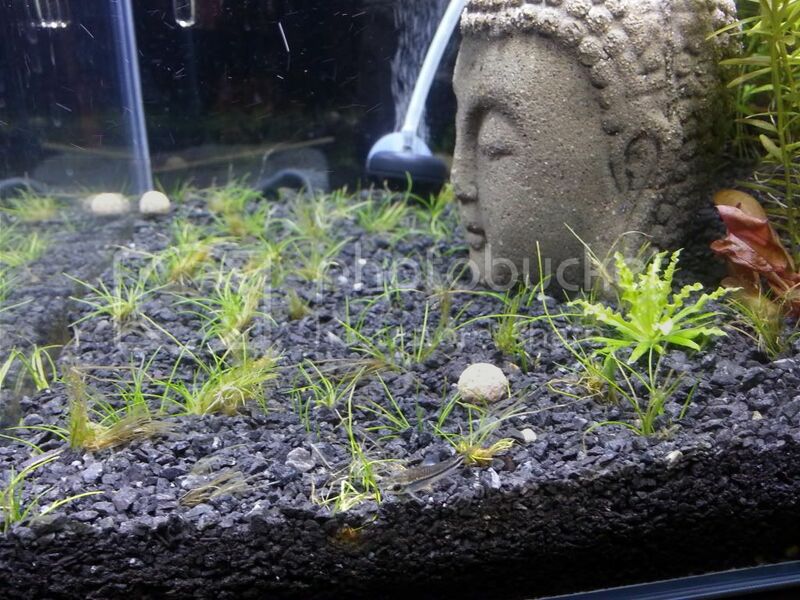 I started with a dry start with the Eleocharis Belem and three tiny downoi plantlets. 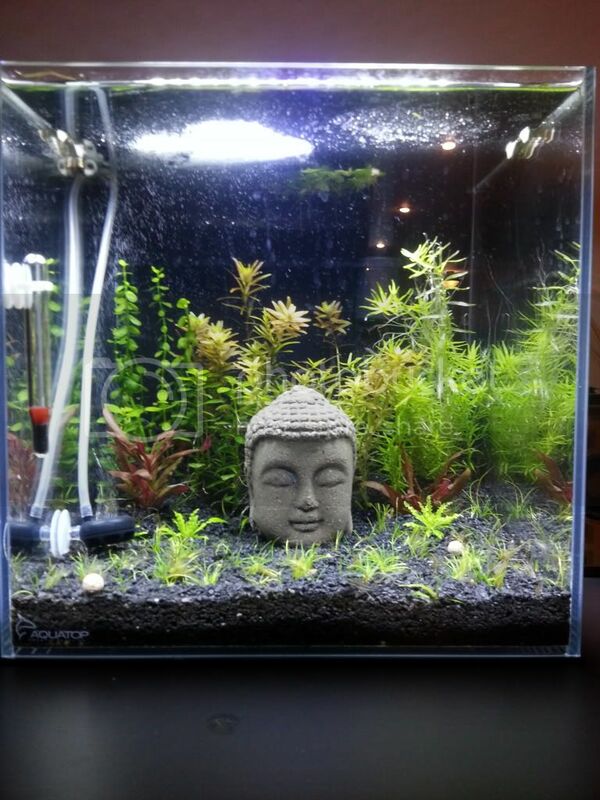 After 2 months I lost patience and flooded the tank. The E. Belem grew so slowly, it just started barely shooting out runners. The downoi on the other hand doubled in size. I love the pymy corys! They are such an energetic fish. I hope I didn't make a mistake by putting them in a newly setup tank. My parameters look good since the media in hob is from a established filter canister filter. 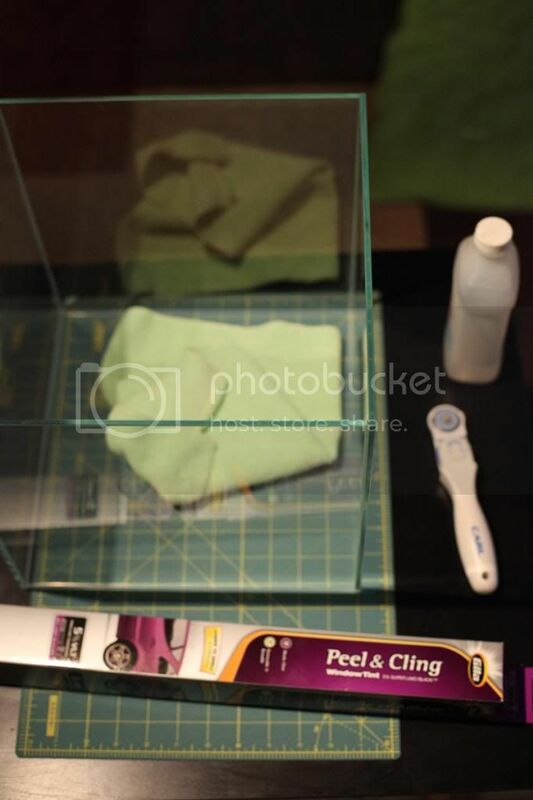 I used self adhesive window tint to black out the back of the tank. 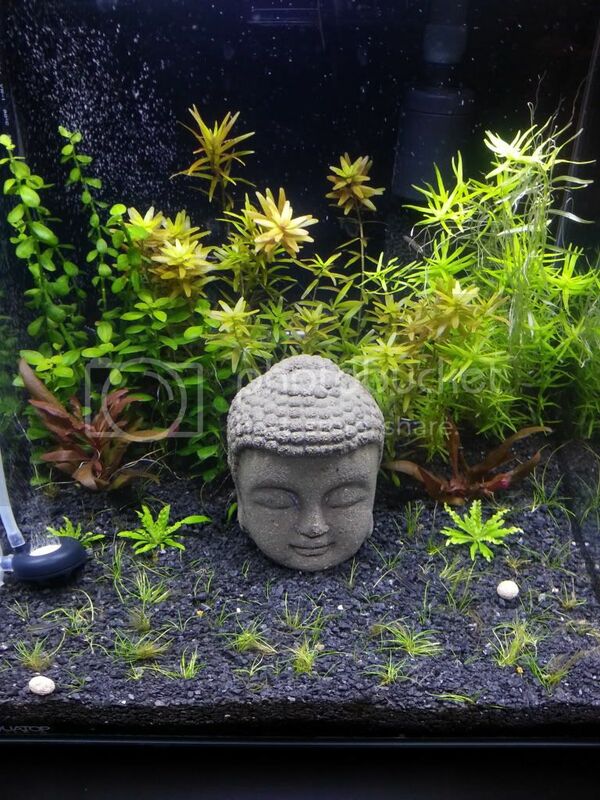 Right before planting and flooding the tank. I didn't bother photo documenting the last 2 months since it mostly looked like this. Maybe E. belem wasn't the greatest choice to go with dsm? Sweet looking setup you have going, I have the same 10" Finnex FugeRay on my Evolve 4. It's such a sweet little LED light isn't it? Wow, didn't realize that you could have so many corys (even pygmy) in a tank that size. Very reassuring for my tank ideas! 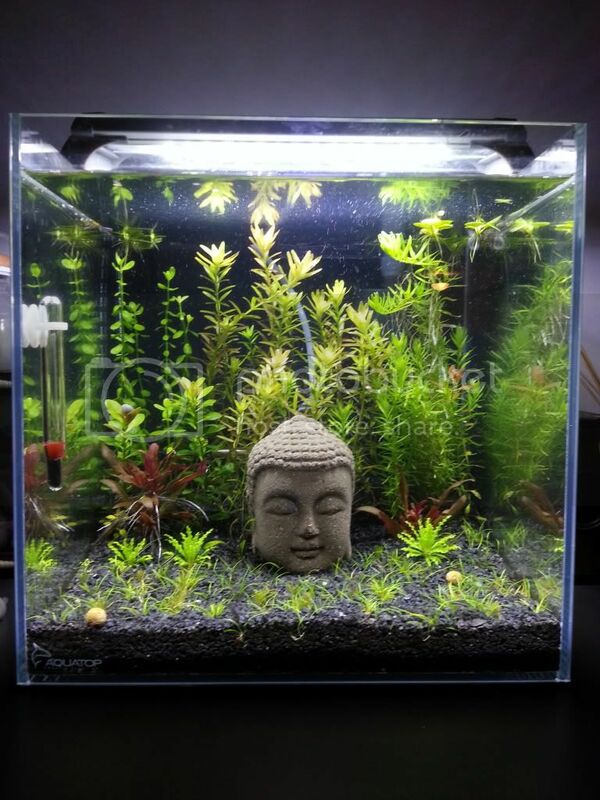 Very nice looking tank! intersted how you go with the cories. i put 8 in a freshish tank and i think ive lost them all. 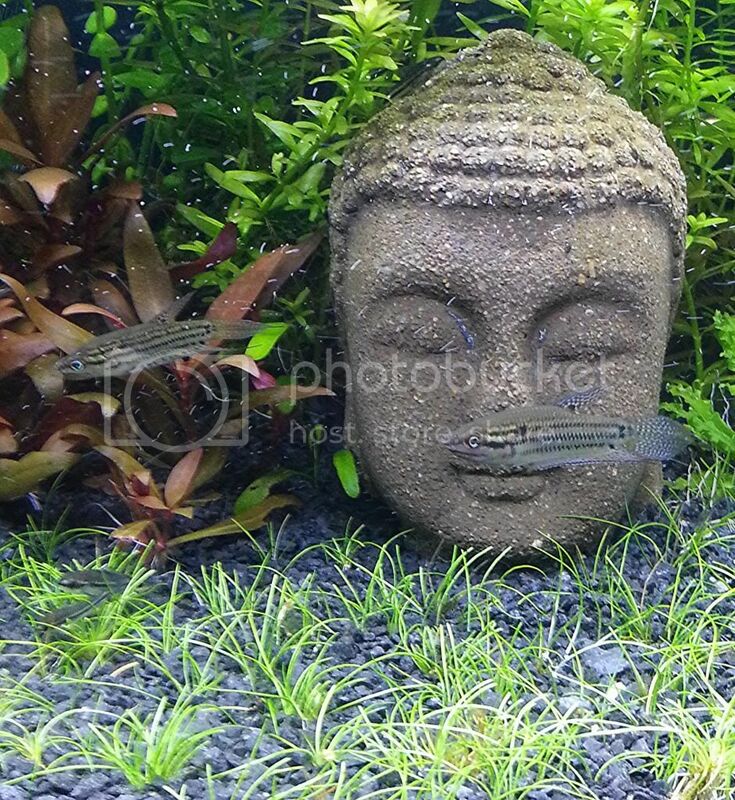 They were an impulse buy at a fish show. So far they appear to be active and eating. I'll post updates on them. I really like them and I hope they make it. Are you sure it's the 10" light? 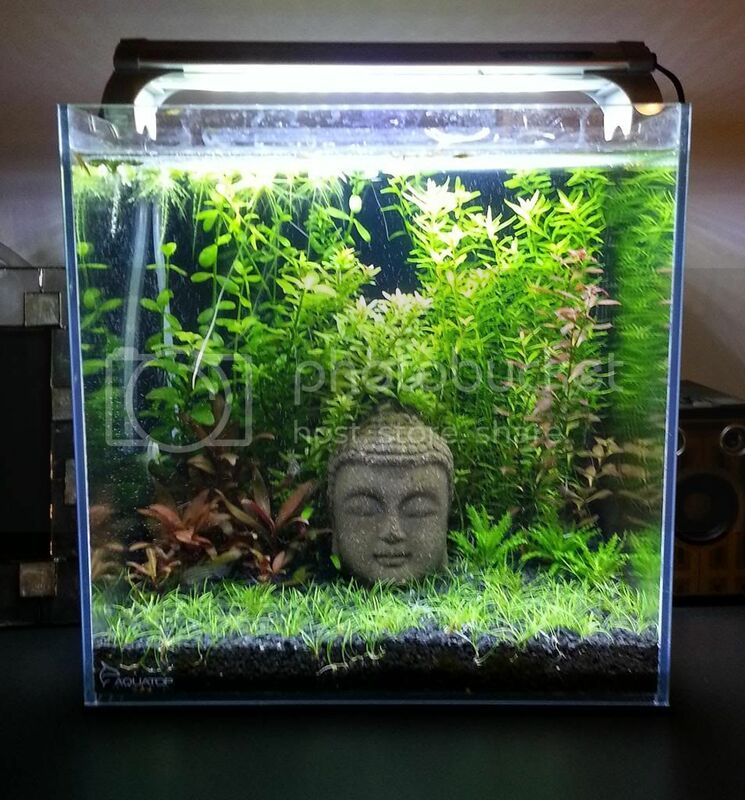 The 7 gallon cube is 12" all around. Duh! You are correct it is the 12" Fugeray, the cube is 30cm about 11.8 inches. When I had the light on during the dry start it didn't look like it was enough light. Now that it's filled it's looking pretty good. I'm aim toward the mid to high end of medium level lighting once the CO2 gets setup. Ran into a bit of a problem with the Buddha head. I took it out to clean what I though was algae growing on the face. Lightly scrubbed it with a toothbrush and the white came off revealing a darker color underneath. They seem to be acting alright. 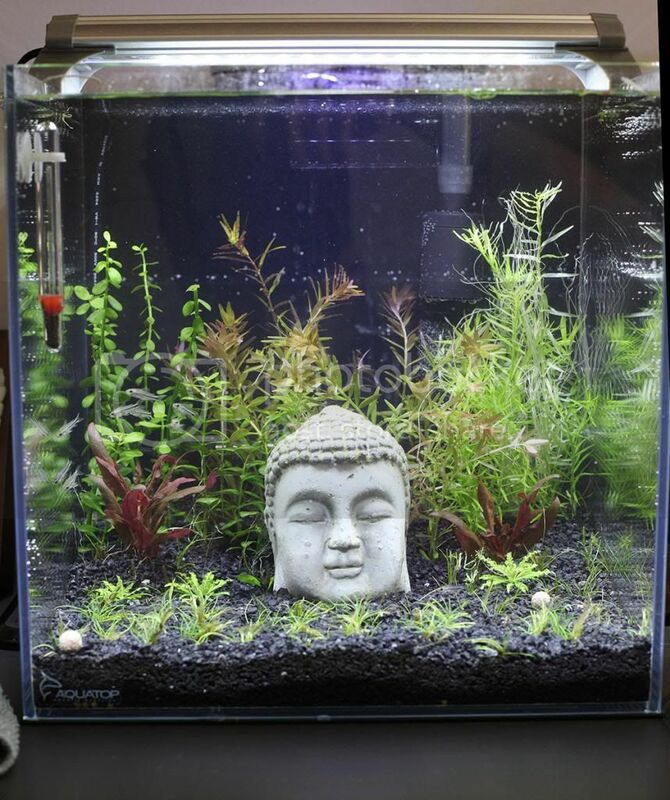 Will probably continue to do some small water changes daily for the next couple of days. Two week update on growth. Trimmed the hair grass in hopes of promoting runners. Added one amano shrimp to control algae on dhg but he seems more adapt at stealing the Cory's food. Pygmy Corys are doing great! The two blue ramshorns have had eggs and I see babies on the leaves. Some type of infection has hit the tank. Noticed that the tails of he corys were gone and they started acting listless. Next day I lost the amino shrimp and two corys. After 3 days of Kanaplex treatment there are no more losses! Fish are back to acting like their playful selves. Moved 2 amano shrimp from my main tank to this one to control some hair algae that I'm seeing start to appear on the glass. 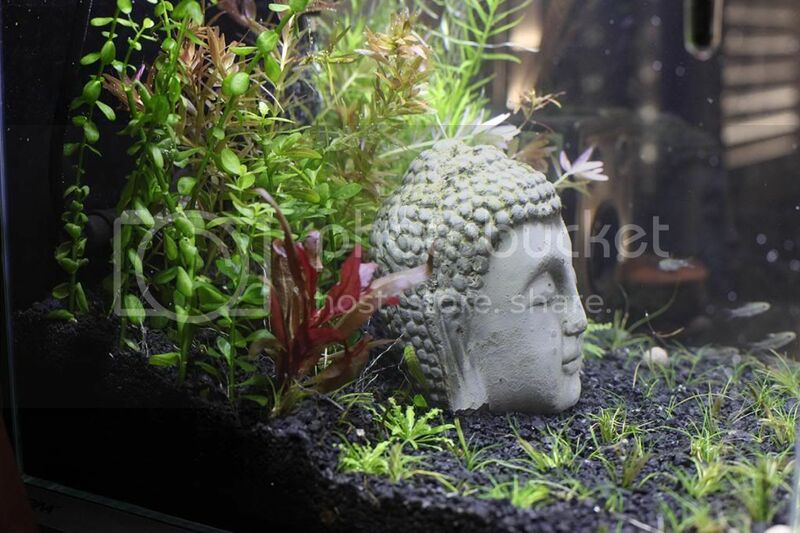 Looking to add either Endler livebearer males or ginga rubra guppies as the next occupant. Tank is now clear of whatever infection was killing shrimps/fish. 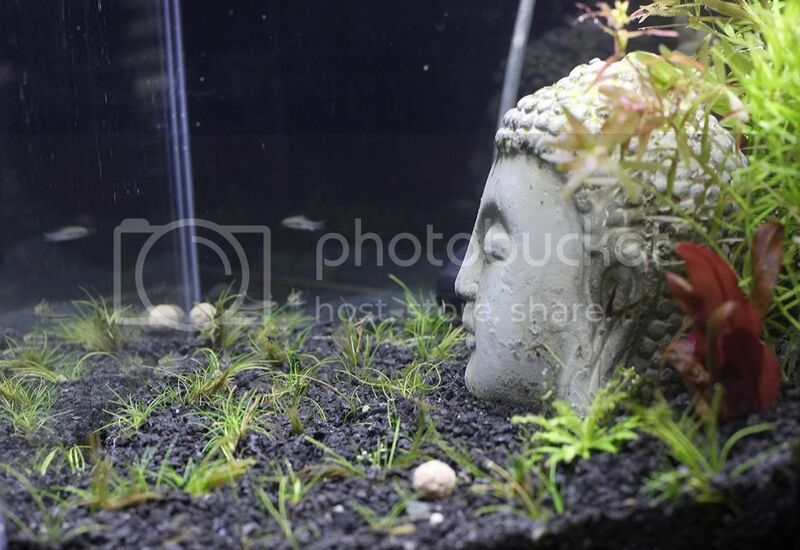 Total losses were 1 large amano and 2 pygmy corys. 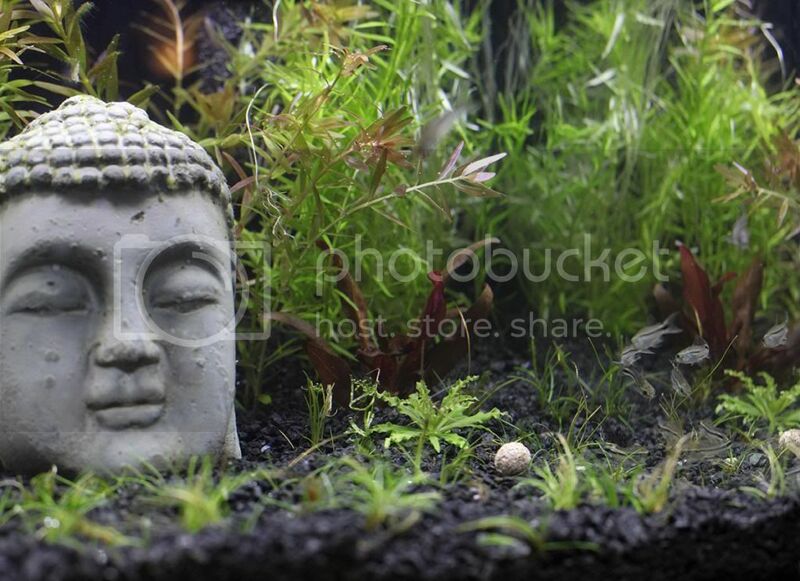 - Added 2 croaking gouramis, I mistook them for sparkling gouramis. If they get too big I will move them to the main tank. 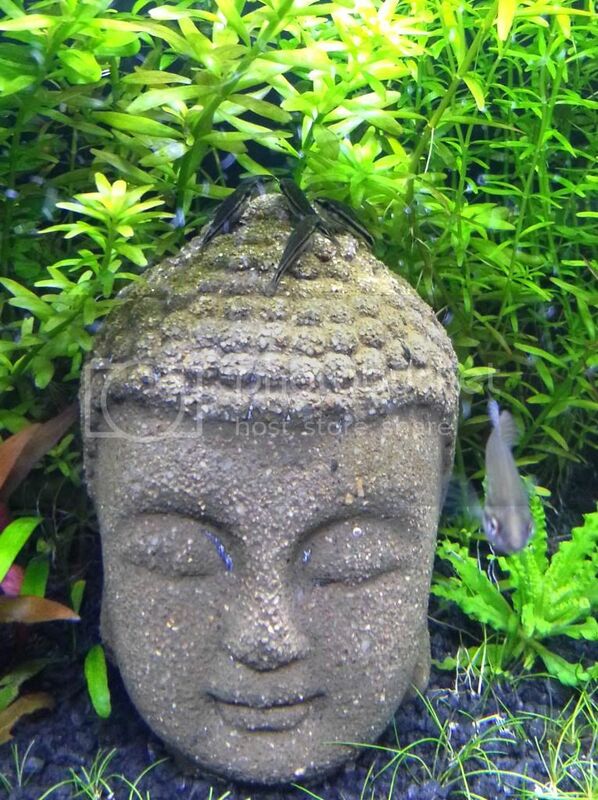 Pygmy cory meeting on top of Buddha's head.